No wonder — the Line 5 concourse is easily confusing, and of course at platform level, there’s a big difference between choosing a way up to change to Line 2, and leaving the station altogether. The fact there are two Exit As, Bs and Cs (at last check) makes it make even less sense. What’s to be hated the most is the fact you have to choose not only your line, but also direction of travel in advance. This isn’t London, where route maps are all over the place; the fact Line 10 is a loop is also a curse-in-disguise. The way-too-cramped Line 10 platforms are also no-one’s favourite. This station has too many exits — and has a super-complex concourse-and-exit system (the interchange paths can equally be confusing). Never mind it looks new — looks only go so far if the station is a mess. At last check, this station has a full double set of exits. Meaning: there is an Exit A for Line 2, and a separate Exit A for Line 5! It has also seen rough days, with parts of the station flooded. Long transfer corridors also make this a less ideal station. Finally, the stairs down to Line 5 from the Line 2 platforms are so overdone, it makes it hard for Line 2 passengers to elbow by! If anything, the worst offender here is the fact you have to go above-ground over a motorway bridge to change lines! Silly, really. Lest you think Wangjing West had a bad interchange solution: the sheer distance required to change between lines is just plain nuts. Especially when changing from Line 9 to Line 1. Take our word for it — just use Line 7 from Beijing West to go into the city centre. This is a station that brings back cursed memories of Paris Charles de Gaulle Airport’s Terminal 1 — something that appears easy at first glance, but is executed in the worst ways possible. Narrow staircases, transfer passageways that take forever, and just plain confusion overall makes it a hard nut to crack for many — to the chagrin of the ridership. What is particularly confusing here is the presence of three lines under one roof. Also, if you opened up both doors for Line 10 trains running counterclockwise, it would be much easier to change onto a northbound Line 5 train to Tiantongyuan North. 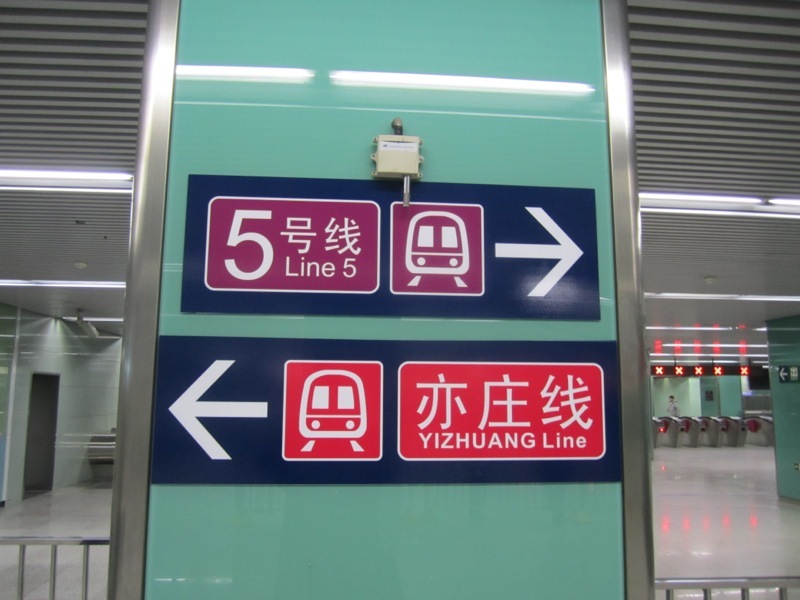 Worst of all, changing from Line 5 to the Yizhuang Line is easy, but going the other way is just a maze. Once upon a time, to change from Line 2 to Line 13, you had to exit the station altogether. And while this is no longer the case, it still is a very poorly-designed station (worse if going from Line 2 to Line 13). The platforms at the Airport Express part are also incredibly narrow at some places.